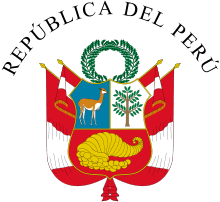 The Republic of Peru is a presidential representative democratic republic with a multi-party system. The current government was established by the 1993 Constitution of Peru. The government is composed of three branches, being the executive, judicial, and legislative branches. The head of state is vested in the President of Peru, who is elected to a term of five years; incumbents can not be re-elected for a second consecutive term. Family members may also not immediately succeed another family member's presidency. The current president is Pedro Pablo Kuczynski, elected in 2016. The executive branch, in addition to the legislative branch, may propose legislation. After legislation is passed by the congress, the President may promulgate the legislation, giving it the force of law. In addition to the president, the executive branch contains the Council of Ministers, which, in addition to the Prime Minister, are appointed by the president. Be 25 years old or older. Members of the Armed Forces and National Police can be Ministers. Article 92 states that members of Congress can be Ministers of State. Run the process of strategic planning, embedded in the National System of Strategic Planning and determining the sector's functional national goals applicable to every level of government; approve action plans; assign necessary resources to their execution, within the boundaries of the corresponding public budget. Approve the budget proposal to the entities within their sector, abiding by the article 32 and supervising their execution. Stablish the management measurements of the entities within their sector and evaluate their fulfillment. Propose the inner organization of their Ministry and approve it according to their competencies attributed by Law. Designate and remove the advising positions or any directly appointed, the heads of public entities and other entities of the sector, when this appointment is not explicitly attributed to the Council of Ministries, other authorities or the President; and submit to the President the new appointees for approval in the contrary. Maintain relations with regional and local government within the competencies attributed to the sector. Issue Supreme Resolution and Ministerial Resolutions. Put into effect the transfer of competencies, functons, and sectorial resources to Regional and Local Government and account for their execution. Execute all other functions that are put upon the Ministry by the Political Constitution of Peru, the Law and the President. The Ministers of State can delegate, within their Ministry, the faculties and powers that are not exclusive to their function, to the extent that it is allowed by Law. Functions 2, 4, 5, 7, and 8 are exclusive to the Minister. Civil Sector: Presides over all topics related to civil rights and commercial law. Criminal Sector: Presides over all topics relating to criminal law. Constitutional and Social Sector: Presides over all topics relating to constitutional rights and labor law. The legislative branch of Peru is vested in the Congress of the Republic of Peru, which is a 130-member unicameral house. The legislators are elected for five year terms on a proportional representation basis. Legislation is voted on in congress, then sent to the president, who may approve it. Universal suffrage is granted to all over the age of 18. Voting is compulsory until the age of 70. ↑ Taj, Mitra. "Keiko Fujimori's brother says he will run for president of Peru in 2021 if she loses". Business Insider. Retrieved 26 April 2016. ↑ Constitucion Política Del Perú 1993 (Ultima actualización / Last updated: July 2011) Titulo IV De La Estructura Del Estado; Capitulo IV Poder Ejecutivo; Articulo 112°. El mandato presidencial es de cinco años, no hay reelección inmediata. Transcurrido otro periodo constitucional, como mínimo, el ex presidente puede volver an postular, sujeto a las mismas condiciones. ↑ "Judicial Branch of Peru". World Fact Book. CIA. Retrieved 4 March 2016. ↑ "Legislative Branch of Peru". World Fact Book. CIA. Retrieved 4 March 2016. ↑ [CIA World Factbook "CIA World Factbook"] Check |url= value (help). CIA World Factbook. CIA. Retrieved 25 April 2016.